Fresh air. Calming water. Breathtaking views. 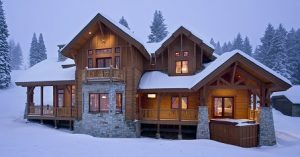 Oftentimes, people dream of building their log and timber homes in places where the peaceful ambience associated with these natural wonders is located. 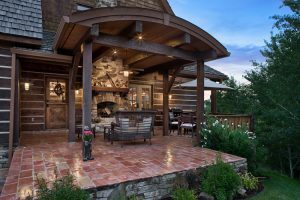 Because of this tendency, outdoor living spaces play an important role in the overall design of log and timber homes. Here are some ideas for expanding your living space from the indoors out. Located at your front door, porches must make a good impression. And today’s wide selection of materials makes that easy to do. Try accenting your porch with beautiful stone pavers, rock, or even stamped concrete. Or create a welcoming outdoor living oasis with a wraparound porch complete with swing. Patios deserve the same treatment as front porches. Have a bit of fun by coloring your concrete to match your home’s natural surroundings. Or create a tile mosaic in the concrete while it is wet. Finally, consider designing separate patios to break up the space. A private patio off the master bedroom or an outdoor dining area off the kitchen easily extends your living space. Decks can provide a nice extension of your log home’s interior living space. A fully retractable glass wall between the home’s interior and the deck will make the transition seamless. Decks can be continuous, or broken into smaller outdoor living areas. The second option adds space for landscaping like flowers, ponds, and large planters. 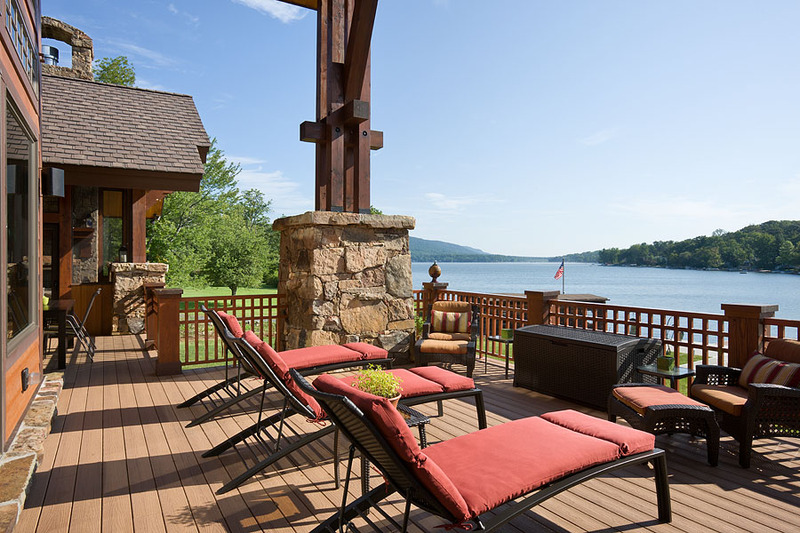 One way to personalize your deck is through your choice of railing. While wood spindles are common, many are opting for iron or even glass. There are a variety of iron styles and patterns, ranging from twigs to leaves and complex twisted shapes. Special glass can be used to maintain views, and make your deck space seem larger. Consider extending other rooms in the house to the outdoors such as upstairs bedrooms and lofts. Adding a balcony or multiple balconies can give you and your guests an instant connection to the outside. Balconies can also play an interesting role in the overall look and feel of the exterior architecture of your home. A blend between a patio and a sunroom, screened-in porches allow you to enjoy fresh air, and the sights and sounds of nature. The screen keeps the bugs at bay in the summer and adds a buffer from the cold of winter. Incorporate a screened-porch on the sunny side of your home to take full advantage of the space during all seasons. Work with your architect to find an area of your floor plan where a screened-in porch makes the most sense. Decks, patios, and balconies are direct extensions of your home. Sometimes, it makes sense to add an entirely separate outdoor living structure to your property. Perhaps your land has a great spot for a lookout, or extends down toward a lake. Adding a permanent log or timber outdoor living space will allow you to fully utilize the area. Place outdoor structures near other permanent features of the property like a pool, outdoor kitchen, or water feature for the greatest impact. 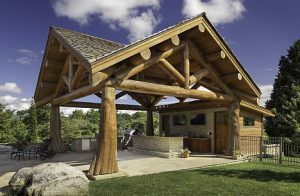 For unique and stylish outdoor living space ideas, visit our sister company TimberScape for unique outdoor living structures.